It appears that the main opposition radical left party SYRIZA is asking for a substantial write-off of the nominal value of Greece's accumulated public debt. In an article in the French daily "Le Monde Diplomatique", which appeared on Friday, the party said it supports this because the money that will be saved may be channeled directly to the effort for recovery of the economy. Speaking to the paper, SYRIZA leader Alexis Tsipras and outlining his plan for Greece's revival, in an article titled "The future of Greece and Europe", he said that the measures should be accompanied by progressive, structural reforms aimed at a more just distribution of the wealth, and added that overcoming the crisis presupposes a break with the country's past that caused it. Tsipras said that it also presupposes the consolidation of social justice, equality before the law, transparency, "in one word, democracy", stressing that such a plan can be applied only by a political party that is independent of the financial oligarchy that holds the state hostage, and of the state-dependent businessmen, and tax-exempt shipowners and bankrupt bankers. According to him, the crisis upset the cost-benefit ratio, and Berlin reacted by exporting the austerity recipe, thus establishing social polarization internally in the member states of the EU south and economic tension inside the euro zone itself, creating an axis of a "creditor North-debtor South" resulting from a self-serving, for the North, new distribution of labor, with the South specializing in labor-intensive products and services with low wages and the North engaging in a competitiveness race of high quality and innovation with a low unit production cost and high remuneration. He observed that Federation of German Industry (BDI) president Hans-Peter Keitel's proposal, in a recent interview with Der Spiegel Online, that all of Greece should become a "Special Economic Zone" in the euro zone is indicative of the real target of the Memorandum which, he said, is being intensified and extended, at least to 2020, despite the fact that it has failed resoundingly as a fiscal recipe, as all of Europe now acknowledges and the International Monetary Fund (IMF) admits. For those who designed it, however, the Memorandum has succeeded as a means of imposing international economic control on Greece and downgrading it into a debt colony of the euro zone, Tsipras continued. 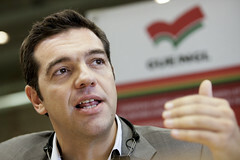 In that light, he reiterated that annulment of the Memorandum is a prerequisite for Greece's exit from the crisis. In any case, the state news agency quoted him as saying that, one must look directly at the real causes of the economic crisis in Greece, given that the substantive and major waste of public monies remains untouched today. A SYRIZA government seeks a moratorium on servicing of the debt in order to change Greece. Without that, any attempt at a sustainable fiscal streamlining would be reminiscent of Sisyphus, only this time the drama will not concern only Ancient Corinth, but all of Europe, Tsipras warned.